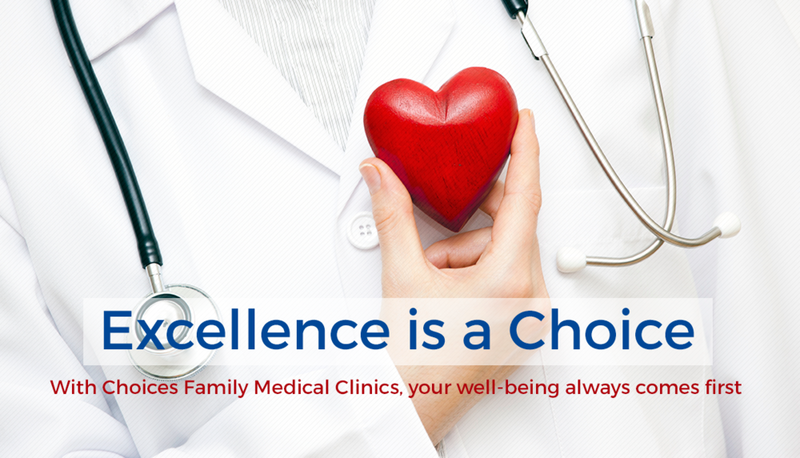 Choices Family Medical Clinics is dedicated to the provision of excellence in all healthcare services our organization offers. In the last 30 years, we have been committed to putting our clients and client families first, guaranteed. Choices Family Medical Clinic’s mission is to deliver the highest quality of personalized care through a multi-systemic approach of treatment and prevention, implementing professional medical care, home services and community services, as well as the patient’s existing support network, to deliver healthy patients and healthy communities. Visit us, virtually! Life doesn’t need to stop for a doctor’s appointment. Choices Family Medical Clinic E-Visit services as an innovative health care service feature to better serve you, on your time and terms. High-quality, personalized medical care from the comfort of your home isn’t a dream. Choices Family Medical Clinic services make this a reality for you and your loved ones.